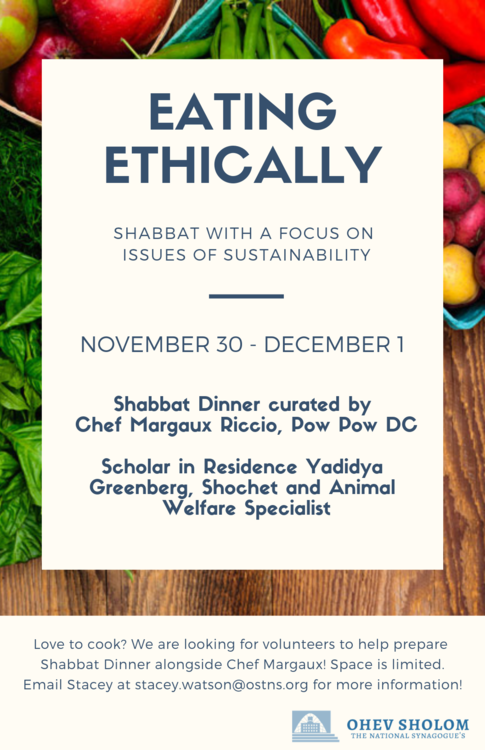 We are delighted to welcome Judy Klitsner as our Guest Scholar this Shabbat. She will speak at Ohev three times: Shabbat morning Dvar Torah, after Kiddush Luncheon, and at Seudah Shlishit. Judy Klitsner is a senior lecturer at the Pardes Institute in Jerusalem. A student of the great Prof. Nechama Leibowitz, Judy is a popular international speaker whose lectures are engaging, interactive and text based. Judy is the author of the award winning book, Subversive Sequels in the Bible: How Biblical Stories Mine and Undermine Each Other, which was recently translated into Hebrew. This week's Kiddush Luncheon is sponsored by Laufer family in gratitude for Erez escaping with only minor injuries from a terrifying fall. Friday, November 16, 8pm for a Torah class with this Shabbat's Guest Scholar, Judy Klitsner titled, "Can you Murder and Also Inherit? A Biblical Story of Crimes, Misdemeanors and Addictions." Sunday, November 18 10:30am for brunch to hear from Rabbi Susan Silverman about adopting and fostering waiting children. Rabbi Silverman's organization, Second Nurture, encourages families to adopt and foster children with the support of their communities. Learn how we can make our community one in which adoption is encouraged and normative. Please RSVP to Jenni at jenni.lauferfamily@gmail.com. 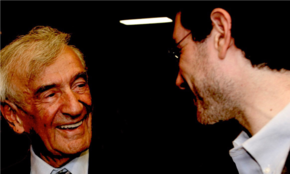 Ariel Burger, author of Witness: Lessons from Elie Wiesel's Classroom, takes us into Wiesel's classroom and crystallizes some of his greatest teachings and shares them in a powerful and meaningful way. Copies of the book will be available for purchase. Parents: feel free to bring older children if you deem it appropriate for them. RSVP at ostns.org/event/witness. This week’s Parsha, Va'Yetzei, tells of Jacob fleeing his home because of Esau's animosity, and living in Haran with Laban, his mother's brother. In Haran, Jacob marries Leah and Rachel. Leah, as well as the two "maids" taken by Jacob, give birth to a number of children. Rachel, disappointed because she is childless, says to Jacob, "Give me children or I shall die." Jacob responds with anger, saying, "Can I take the place of God to give you children?" The same idea, that God does not forget improper conduct, was illustrated in last week's Parsha, Toldos. Jacob tricked his father and received the blessing meant for Esau. When Esau learned of the deception, he "cried a loud and bitter cry." (27: 34) The pain inflicted on Esau by Jacob is not forgotten by God who exacts repayment in the Book of Esther. When Mordecai, Jacob's descendant, heard of Haman's decree to destroy the Jews, he "cried a loud and bitter cry." (Book of Esther 4:1). Even though it was God's intention that Jacob's descendants receive the blessing, since that goal was achieved through pain on Esau, they too had to suffer pain. This week’s Haftorah is from the prophet Hoshea, 12:13-14:10. Linking with the Parsha, the first verse refers to Jacob working for Laban and marrying Leah and Rachel. The second verse refers to Moses freeing the Jews from Egypt. These verses are the historical background for Hoshea's chastising the Jews for their sinfulness and unfaithfulness to God. The latter portion of this Haftorah is also the Haftorah for Shabbos Shuvah, the Sabbath of Repentance: "Return, oh Israel...for you have stumbled in your sin." 4:10p Mincha, followed by Seudah Shlishit with a Shiur from Baruch Triolo on "The Revival of Judaism in Sicily after 600 years"
Don't see a donation listed? If you believe a gift was omitted, please contact our office (202) 882-7225 or info@ostns.org. We will never list gift amounts in this email.